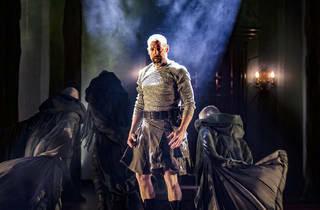 Stage magic and surprising laughs combine to make a spooky, memorable Scottish Play. 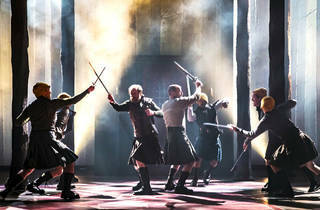 Did you know that Macbeth is actually quite funny? No, really, it is! Everyone from the Scottish King on down to the lowliest servants is a real comedian, wryly commenting on the weird (or should it be wyrd) twists of fate that have thrown their beloved Scotland into blood and tragedy. 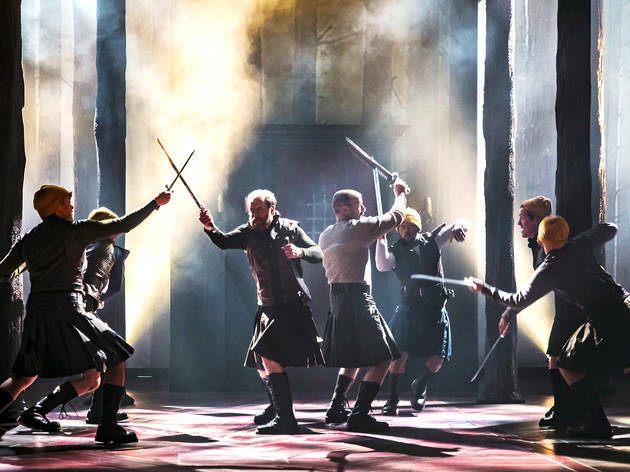 If directors Aaron Posner and Teller (of Penn and Teller) have achieved nothing else with their production of Shakespeare’s accursed Scottish Play— they achieve quite a lot—t’s that they have unearthed the play’s heretofore unknown funny bone. 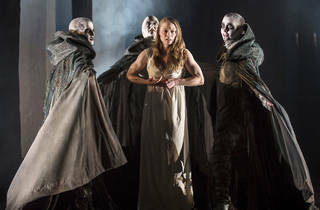 As was the case with their luminous The Tempest, which played Chicago Shakes in 2015, Teller and Posner utilize live magic techniques (designed by Johnny Thompson) to enhance the play’s supernatural elements. Various ghosts appear as if out of thin air—though the suspicious clusterings of actors that mask their entrances somewhat give the game away—and the show makes spectacular use of illusions and even something as simple as a few well-placed blood packs. 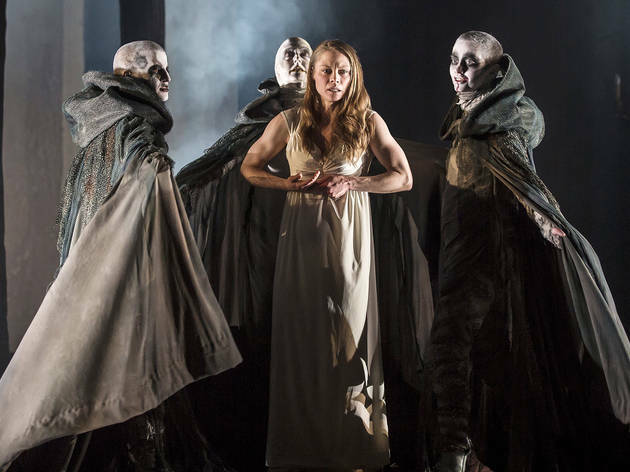 The effects here won’t steal your breath the way they did in The Tempest—they’re a little hokier, less “how did they do that” then “oh it’s fun that they did”—but they’re in keeping with the production’s arch, camp-horror sensibilities. All of this would amount to a good time, if not a particularly illuminating one, were it not for the acuity of the leading performances. 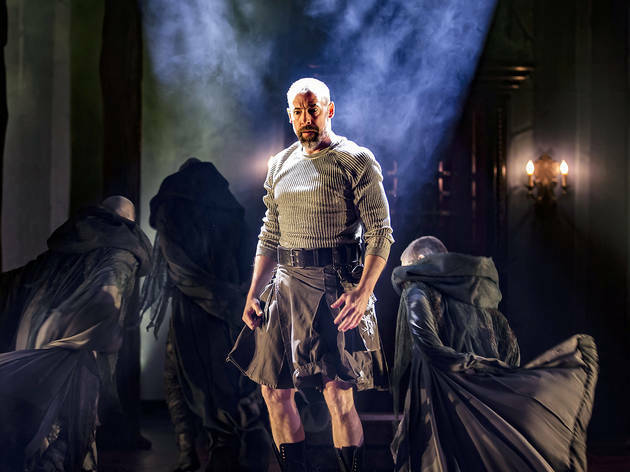 Ian Merrill Peakes is a Macbeth perfectly ill-suited to the task before him. While an excellent soldier, he is a terrible murderer. 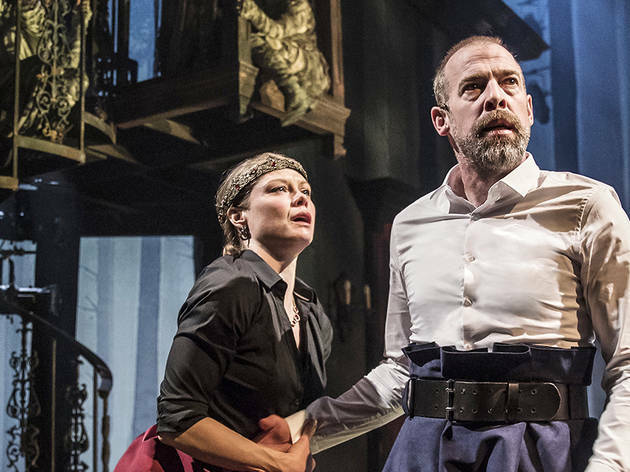 As Peakes plays him, Macbeth is a neurotic mess. Once he hears himself named Thane of Cawdor, he’s as much terrified of what lies in front as he is excited. And though he does indeed manage to “screw his courage to the sticking place” and do the dang thing, his descent into tyranny seems almost like a coping mechanism. He’s just not built for this. Meanwhile, we first meet Lady Macbeth (Chaon Cross) stroking the coffin of her dead child, a bit of backstory that, in this case, helps to center her righteous fury. 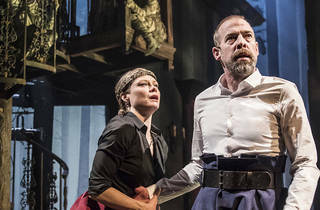 If her husband is a nervous jokester, peevishly bungling his way towards the crown, then Lady Macbeth is a devilish crusader cutting down anything in her path. Cross brings a psychological complexity and a tragic nuance to the role—her “out, damn spot” breakdown is as heart-wrenching as it is deeply creepy—without forgetting that she’s also a fantastic villain. 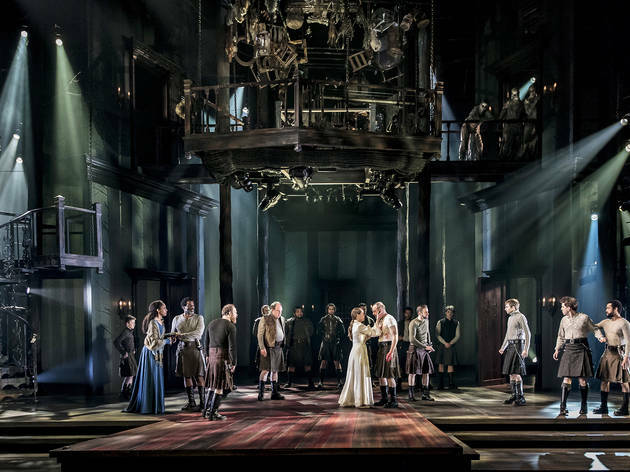 For as arch as this production can be at times—and the humor does occasionally lessen the play’s impact—it never forgets to leave room for the actual trauma of living in a horror story. When Macduff (Timothy D. Stickney) breaks down at the news that his wife and children have been (brutally!) slaughtered, the play slows down, giving his suffering the room it needs to work its way into your bones. 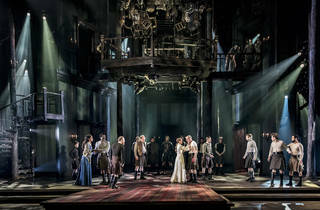 Every character in this play suffers; the lucky ones get it over with quickly. By bringing the play’s supernatural elements to the fore, Posner and Teller make clear that none of these people are really in control. The witches (McKinley Carter, Theo Germaine and Emily Ann Nichelson) here are white-skinned monsters-of-the-week (with makeup by Richard Jarvie) who preside over the whole twisted affair like angry demigods. It’s clear that they are the ones in charge. No wonder everyone is constantly commenting and quipping. They’re just along for the same terrible ride, whistling a tune to ward off the dark. Chicago Shakespeare Theater. By William Shakespeare. Adapted and directed by Aaron Posner and Teller. With ensemble cast. Running time: 2hrs 20mins; one intermission.